My little artist, Gwyn, age 7, is currently working her way through the Level 1 (she has one more to go) art DVDs by Creating a Masterpiece. A few months ago she completed the Sunflower Lessons in Pencil Drawing and Rainbow Butterfly Silk Dying be sure to read our review on these two lessons. Gwyn absolutely ADORES Sharon and she has even had the privilege of meeting Sharon a few times at homeschool conventions. Gwyn was thrilled when Sharon asked if she could display Gwyn's work at one of the conventions. 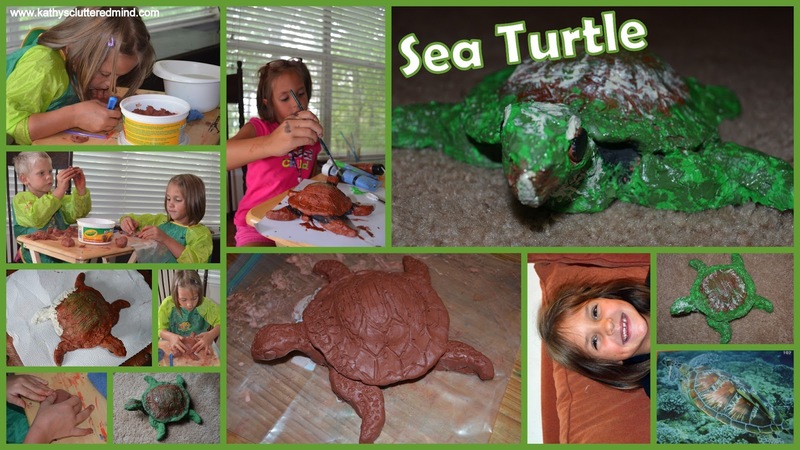 I recently told Gwyn that Creating a Masterpiece would be in Atlanta for the SE Homeschool Expo in July and Gwyn immediately replied, "Please mommy can I go, I want show Sharon my turtle." Sharon is a fabulous instructor and the connection she makes with children over a DVD is amazing. Each time Gwyn creates a masterpiece she cannot wait for Sharon to see it....I only wish we didn't live thousands of miles away from each other. But thanks to the internet Sharon is able to see Gwyn's creations via Faceboook and our blog and she takes the time to comment on each of them and provide encouragement. So be sure to share your photos of your families creations on the Creating A Masterpiece Facebook Page! This post will highlight the following 3 Level 1 DVDS: Earthenware Sculpture The Turtle, Colored Pencil Tropical Clown Fish, Acrylic Carribbean Lighthouse. But first here is some information about Creating A Masterpiece. I highly recommend (especially if you have younger children) that you watch the DVD through once or twice prior to starting the project. This will allow your child to soak in all the information and understand each step thoroughly before getting started. This will help ease any worries or frustration (trust me)! I personally utilize the 20% discount Micheals gives to homeschoolers (just show some kind of proof you homeschool like a declaration of intent, homeschool buyers co-op id card). Plus you can also still use a 40% off coupon on top of the educator discount. We have been purchasing the Artist Loft materials (from Michaels) which are very inexpensive and decent quality. Below I have a breakdown of each DVD we received, pictures of Gwyn's finished masterpieces and some more specific thoughts. This DVD takes students step-by-step through the process of creating a beautiful, colorful fish on bristol paper using colored pencils. 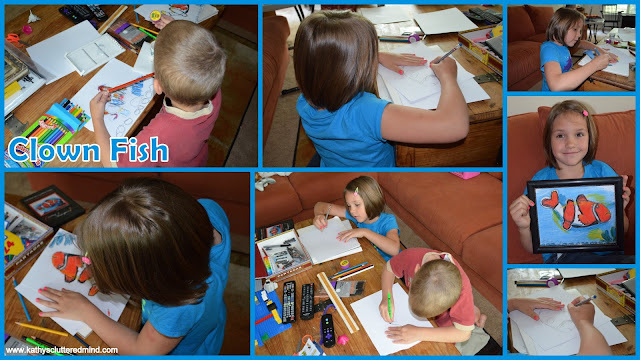 Children will first draw their fish using a pencil. Sharon will explain how to use simple shapes to create a clown fish. Then children will then use colored pencils to create an effect that looks like paint (and yes when I posted her picture on my Facebook wall all my friends thought it was paint). Children will learn about how to blend 6 simple colors (believe it or not there is no orange) to create additional colors. The materials for this lesson include bristol paper and colored pencils (scarlet lake, white, black, yellow, photo blue, indigo blue). Gwyn did fabulous with this project and needed no help. She loved adding her own special touches to her masterpiece like the seaweed and swishing fish tail. We purchased a black from from Dollar Tree to display her artwork. This DVD takes students step-by-step through the process of painting a Caribbean Lighthouse using acrylics on canvas. The DVD explains how to use acrylic paints, how to break up your canvas into sections, shading and more. The materials for this lesson include a canvas 11"x14", brushes (several sizes) and acrylic paint (black, cadmium yellow, cadmium red, blue and white). Gwyn practiced on a sheet of paper a few times before she did her final project on the canvas (she is quite the perfectionist). Believe it or not there is not much pencil drawing in this project. Gwyn did pretty well with this one too, I only needed to help her with taping off the lighthouse. And she of course added her own details, like the flying birds. We did find acrylic paint a little more difficult to work with, but the end result was beautiful. Gwyn even named her island, cattail forest. Gwyn created this masterpiece just a few weeks before we got to visit and tour a real lighthouse in South Carolina. The combination of this artwork and our trip sparked an interest to learn more. So in a few month we will be doing a lighthouse unit study. This DVD takes students step-by-step through the process of sculpting a turtle. The DVD explains how to work with clay, make textures and use crackle paint. It really is quite amazing how the textured wrinkles really bring the sculpture to life and make it look like a real turtle. The materials for this lesson include 2 lbs of self hardening clay, sealer spray, kroma crackle and acrylic paint (raw sienna veridian and black). Gwyn had a lot of fun with this one and learned all about patience as well! This project spanned over a few days because you must allow time for drying of the clay, paint, crackle and sealer. So be sure you talk about the process before starting because as I am sure you know little ones want instant results and have trouble waiting! The only issue we encountered with this project was not being able to find the kroma crackle at local stores. So we improvised and tried two different products as replacements, one didn't work that great but the other did. So if you wish to use the kroma I suggest ordering it online prior to beginning. As you can see Gwyn really added her own touches on this one and decided to create a beautiful sea turtle for their beach themed bathroom in our new house. She needed very little help with this one and used one of our New Leaf Publishing science books as inspiration for her turtle. One other quick note about this project is that it can be fragile especially if a leg, head or tail is not attached correctly so make sure your children know to be gentle. We did have one leg fall off, but Gwyn told me not to worry because Mrs. Sharon said you can just glue it back on...which is just what we did! These 3 DVDs really provided great lessons on color for us. Gwyn learned all about shade variations, blending, the color wheel, color theory, etc. We also even dug a little deeper and explored where names like ultramarine, cadmium come from, this website was very helpful. Even Rowyn my 6 year old son got involved in the lessons. He generally prefers to play with his Legos and doesn't really care to "do art." However when he sees the masterpieces his big sister creates he gets a little more intrigued each time and wants to give it a try. All of the skills learned in these DVDs can easily be applied to other other creations. Encourage your children to use the skills they have learned to create additional masterpieces. Recently I took an old scrapbook organizer and turned it into an art supply organizer for Gwyn. 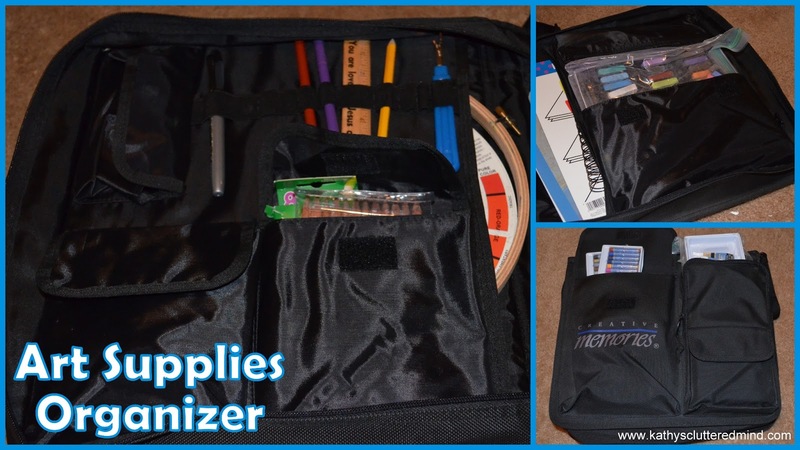 Now she can easily take her supplies anywhere including outdoors. Shhh don't tell her but I am getting her an art isle for her new bedroom. I liked these DVDs A LOT. The turtle was the most fun. I liked working with the clay and painting. I learned that you have to wet the clay to make it smooth. 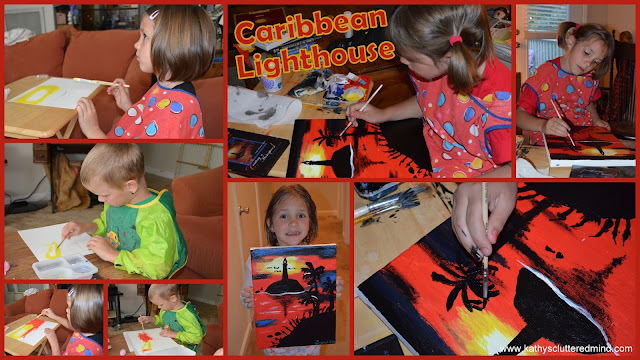 When I painted my Caribbean lighthouse I learned how to use tape to mask off a shape. When I made my clown fish I learned how to blend colors together to make it orangey looking and like it was painted. Mrs. Sharon is a great teacher. She is really, really good at making art. My daddy is an artist too and is proud of me when I make pretty pictures. You can purchase these art curriculum DVDs directly off the Creating a Masterpiece website. Each lesson is $35.00 or you can purchase an entire level (6 DVDs) for $179.00. Use the coupon code setof6 to choose ANY six DVDs you want for $179.00 the coupon codes saves you $31.00!!! Wow! This sounds awesome! I love the Sea Turtle project. 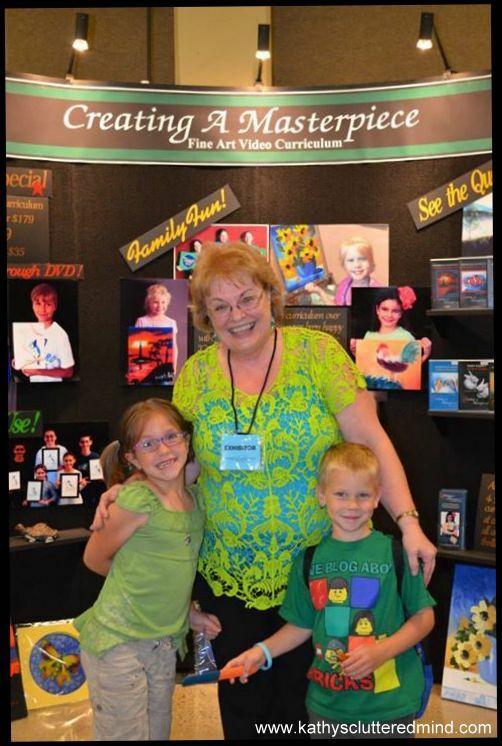 I saw their booth and spoke with them in depth at the Great Homeschool Convention in March in Greenville. It looks like a great product. That sounds great! I may just have to consider this for next year. I don't think I've ever heard of Creating a Masterpiece. Your kids art work is great! Thanks for the review. Wow, that sounds like a GREAT program. I'll have to check it out for my little band of art lovers! I am impressed! I think that DVD instruction for art is the way to go, for sure. Tell Gwyn I love her turtle! I really like this idea. The dvd seems like a good idea in that you could pause it when needed etc. Thanks for the review.